I have not had any issues with a suspension rattle. Given the overall quietness of the car I'm sure I would notice any unusual noise. What i am wondering is whether or not any of the TSBs apply to the Hybrid. I thought i read somewhere here that you could go to the Acura site and put you VIN in and find out if there were any TSB's. i did that for the seat belt issue [which if memory serves me is a recall not a TSB] and the Acura site did not show any recall for my car. So far I have had no issues with my car for the first 750 miles. See my TSB posts in the TSB thread. Every TSB I list has affected models, years, trims, and VINs. No clunks at 330 miles so far. This car is so quiet in EV mode that you would notice any extraneous noise. You can be sure this beta-tester will be on the lookout for such issues. 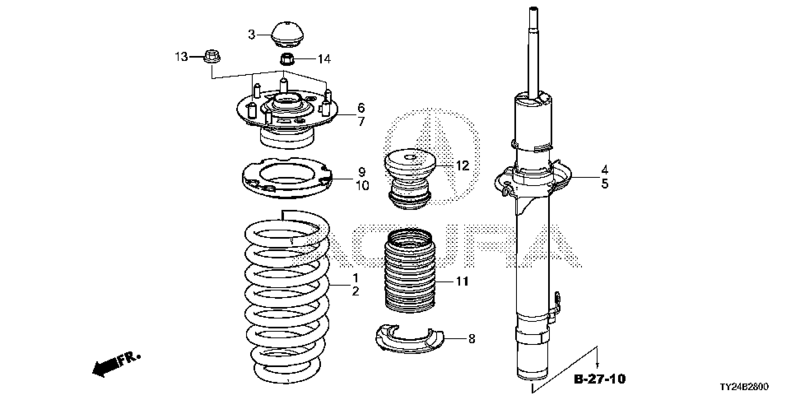 The replacement part number shown in the tsb for the front spring/damper assembly is the same as the original part number for both the rlx and the accord. Given this, it is unclear what-if anything- has changed in terms of the design and/or materials in the assembly. If there is no way to differentiate the old part from the new part, one can only assume that there was some manufacturing defect in a specific lot of parts that could only be traceable to date of mfr date codes. However, the tsb doesn't state that the dealer must identify the date code. Under "vin" it says all 2014. Again, no tsb for rear dampers/springs either. Actually, the tsb lists a part number for the "strut noise kit" and the "failed part number" but the kit includes various components and does not show specifically the part number for the spring/damper assembly contained in the kit. So, who knows? The Sport Hybrid is so very quiet even when the engine is running that it makes you notice other noises. It makes me wonder if we're not all going to try to get the wind noise TSB just because we can hear it now! Maybe they're packaging everything together and shipping it so that the technician knows that he is working with the newer parts designed to eliminate the noise. My problem with their approach on this TSB is how subjective this can potentially be. They state for the technician to first confirm that the issue is prevalent. B: the technician isn't such that doesn't perceive the "rattle" to be an issue and just thinks it's "normal". IMO, this is not a good way to address this problem. It's too open for interpretation and/or conditions that don't allow the problem to be exposed. Last edited by holografique; 11-07-2014 at 05:02 PM. I'm sure they mean well but where the good intentions fall apart is the levels between corporate and the dealer, the middle level people with the mission to save money. Are you saying you're already having problems with implementing the TSB? ^ no, that's not the case, and sorry if I implied otherwise. Was just thinking ahead to gain some perspective on my upcoming service visit next week to see if this can be addressed (along with a general inspection of the car post repairs from Nalley, and performing the 12 volt TSB, which is something I did report previously and should be on record). I'll report back if I run into complications. Our RLX and ILX are both serviced exclusively at Acura Carland and they have been great to me since first becoming a service customer in 2008 with my 06 TL. They have yet to ever do me wrong till this day. Great service team and great service work. You are absolutely right. This should be a recall for a known defect, which they have admitted is present in all 2014 RLXs (who knows about the 2015s?). This should not be contingent on a subjective road test and the assessment of a service tech. Moreover, how can customers be absolutely certain that this defect does not in some manner compromise the safety of the vehicle, particularly in light of the other suspension defects, recalls and catastrophic failures in the field? Importantly, the tsb does not address the same defect in the rear suspension. There is no doubt that it exists. Anyone else who has observed this clunk and rattle should weigh in on this fact. What are they going to do about it? Hope it goes away? Release another tsb for the rear? If the latter, when? If acura cares about their reputation for quality and integrity, they should recall all of the cars with this defect and replace whatever needs replacement-assuming they have truly determined the root cause and developed the permanent corrective action. Personally, ANY car that has a clunky sounding suspension is wrong, luxury segment or otherwise. This is one reason I am waiting to see if it is addressed before pursuing a SH RLX. Unfortunately a recall is safety issue. At this point there is no evidence (at least that I have seen) that there is any safety impacts other than sounding bad. A defect alone will not generate a recall. Peeling paint is a defect, but that will not generate a recall and will be addressed on a case by case basis. The company is simply trying to mitigate the costs to replace something that have admitted does not perform to expected levels. And apparently it is a big issue over several models. If they feel it is better to risk customer relations and brand reputation than good will replacements, they can just mitigate the replacements with whatever criteria they deem. Those who make a good case or make enough noise will likely be addressed. Good business or bad, they know there are a good percentage of cars where no issues will be reported or even noticed. And they are banking on that. My service mgr/dealer has ordered the parts for the repair w/o verifying thru tech the noise exists. He is taking my word for it which is a good case for service tech/mgr listening to the customer and meeting the customers request. I admit I have only heard the rattle a few times over certain pavement conditions, but it does exists. Do you have it in the rear also? Tsb only covers the front. Thanks to all who responded to the question on the suspension noise. Fingers crossed nothing to report on my end. Maybe Acura did fix a few things on the HySHAWD. No, I d not have the noise in the rear suspension. I think the noise is well known and documented, but not prevalent. I didn't have it in my last RLX, and there's no sign of it in this one either. Dealer just called to set up an appointment on the 21st for the Strut Noise Kit ( TSB -14-040 ). I know which road I will drive it on after the work. I will send another message after that. Good detective work ! keep sending the TSDs. What is your source for stating that it is not prevalent? Anecdotal info on this site? Other? Acura's tsb covers all 2014 RLXs. Still, they have yet to offer a fix for the rear suspension rattle, nor has anyone confirmed that the front fix works. What is your source for stating that it is not prevalent? Anecdotal info on this site? Yes, it is based only on anecdotal information watching here and vtec.net, and extrapolating that people who visit sites like this are likely to be the most involved, and pickiest users. I'm not going to deny for an instant that the information is anecdotal and that if we wanted to assert a positive statement anywhere we would have to conduct more research. For all we know, the TSB came out because of Acura's own interviews and surveys of people who own the cars, and the clunking was among their list of complaints and it was a prevalent enough issue that they felt action was necessary. I apologize if the way I conducted myself gave you any idea that I was presuming to speak with any measure of authority in the matter. No need for an apology. I just wanted to know if you had additional actual data from a credible source about the incidence of this defect and/or the number of customer complaints. Go to Non Hybrid Advance and you get the exact same part number. What am I missing? Dealer just called to postpone the repair. Parts are on back-order with no promise date. This makes no sense. One has to wonder whether there is more to this reported shortage of parts for a tsb that has just recently been released. Have many more owners than previously believed reported this problem and hoovered up the supply in as little as a week or two? Is there some other serious supply issue with the vendor? I have an appt for the week after next. The parts are in. Still no indication of what acura intends to do about the same problem with the rear suspension. hmmm...and I just dropped mine off at the service center today to get this done, along with inspection on the recent accident repairs. on the brighter side, I got a brand spankin new TLX V6 Tech loaner for the weekend. I have received one report that this repair corrects the problem with the front suspension rattle and clunk. I plan to have my car repaired in about a week and will report the results. I have been informed the parts are on hand and just hope they don't unexpectedly become back ordered before I can have it done. Still waiting to hear what acura intends to do about the same problem in the rear suspension. No news on this defect. I'm not sure you're missing anything at all. People have been speculating for some time that there is only one suspension, and that it was designed for the 5G Legend/Sport Hybrid. Can't claim to know for sure, but as time goes by that's certainly looking more and more like it's the case! And that'd explain the jitteriness complaints that people have been making about the low speed, rough road travel of the USDM RLX. This car SERIOUSLY needs magnetic ride control for those who like a softly sprung ride. In my CTS-V it's a button press to change from Cadillac-smooth to firmer, near-sports car ride. In fact, my two Vs were the first cars in years I did not immediately modify the suspension in. Personally, I like a firm ride as it helps me to "feel" the road conditions better; the RLX hybrid is pretty good but not perfect in that regard. I don't think I'll be modding this suspension. Has anyone had the front suspension tsb repair done? If so, results? Please indicate whether you have the same clunk and rattle in the rear and what you have been advised by dealer/acura about that repair. I received an update from my service rep on Wednesday that they were moving forward with the TSB on mine, and that it was going to require some additional time as the TSB requires some cooperation with Acura's Tech/Engineering team, as well as ordering parts, etc. I told them to take as much time as needed to try and get this right. I'm looking forward to see what the results are. Seems odd. Didn't the dealer order and confirm receipt of the tsb repair parts prior to scheduling the service Also, why would the cooperation of acura tech/eng be necessary to replace the parts in the tsb repair kit unless there is some question as to the proper installation of the repair parts or the effectiveness of the fix? ^ No. The dealer was not able to order or confirm repair until the car came in for them to check it out and confirm that the problem existed and was reproducible. So I don't think there's anything necessarily odd about it. As for why Acura needs to be involved, I don't know, and they didn't go into details. I trust they have a good reason for it. At this point I'm just glad to see acknowledgement and attention with steps being taken to work towards a resolution, understanding it just may take time. I'd rather it take time to get it done right, rather than it being a quick "band-aid". After 10 days of no news, I called the dealer to see what he might know about the repair pahts ( guess where I'm from). He knows nothing. Has anyone had the repair done ? I am curious do you. Hear the rattling when the car is moving over just poor road conditions? In my car when I amoving over rough roads I hear nothing, for no rattling. In my vehicle, there are both a rattle and a clunk depending upon the road conditions. The rattle occurs most often when driving on broken pavement which is common in my area due to frost heaves. The rattle sounds like something is loose. The clunk occurs often when hitting a slightly recessed man hole cover. In both cases, the sounds are coming from the front. ^ This description is par on par to my experience. Only adding to it the hard "shock" and "jarring" that occurs to the vehicle when hitting things like pot holes, recessed man-hole covers, and other conditions that create sudden or harsh changes in pavement elevation. It's as if the car just "bottoms out" and has no shocks whatso-ever. My RLX is ready for pick-up today after having the suspension TSB done. That may just make me the first person here on the forum to report on the results. I agree with the two descriptions above of the clunk and rattle. However, in my car it has clearly been in the front and the rear. This is consistent with what acura reps stated in the arbitration hearing, i.e. the defect is common to all 2014 RLXs and is both front and rear. The repair was done to the front suspension my car yesterday. At the time I dropped it off, the service department reiterated that they still have no info from acura regarding the rear suspension. While there may be some improvement in the front end, it is difficult to assess the degree of improvement. The problem is that when driving-even at moderate speeds- the rear wheel hits the bump within a fraction of a second of the front wheel hitting the bump, making it difficult to isolate the source of the noise and vibration. It is still clearly quite perceptible and annoying. Whether it is now emanating exclusively from the rear is hard to assess. Over the next week or so, I will try to discern exactly what is going on and where. However, I am certain that the rear suspension needs to be addressed as well. Good news: the loose "rattle" "jumbly" sound is gone. you don't get that sound of the chassis being lose or "stuff" jumbling around anymore. The service documentation clearly states that there is a "faulty valve" in the suspension that is at fault for the "noise/rattling". No other details provided. At this point, I've come to the conclusion, that I'm just going to have to live with the fact that this is how this car rides. Whether it was intentional or a design mistake, I honestly don't have the time to care anymore. Too many other important things in life going on right now. I lease the car, I don't plan to buy it either at the end of the lease, so at this point I just don't care. We'll see if Acura does anything to change or address this come 2016, for what I feel is a poorly designed suspension for what should be a "luxury ride" for a car at this price. If not, then I'll most definitely be looking to make a move when my lease is up. A6, E350 or a GS. I loved the TLX and it's a superb car, but it's too small for what I want and doesn't carry the additional "luxury" that I want. I really hope Acura figures it out. Last edited by holografique; 12-05-2014 at 06:17 PM.